Don’t you want to decorate and lighting up you home around nicely? A solar powered motion security light is obviously a best option for this. It’s a best option because you don’t need to worry about power and it has an amazing feature of motion. But buying a motion sensor security light can be tricky most of the time. There are hundreds of various makes and models available on the market, and they are in various sizes and shapes. If you want to use it as an outdoor motion sensor, then you obviously want something what’ll be able to hold up to around all year with all kinds of weather, where as if you want to use it as a motion sensor inside of your home, you may want something discreet and won’t clash with your home decoration. Motion sensors have different kinds of alert types and various detection area sizes too. The bigger the solar panel, the powerful the motion light is, obviously. We’re here to help you to find the suitable and best solar security light for your home. It can light almost any kind of dark area. The powerful motion sensor light uses solar power to light up with a bright light. It has 60 super bright LED lights that become on when the sensor detects motion, upto 30’ away with a 180 degrees detection range. This light is powered with a 1W/6V solar panel. It has a 900 mAh 6V rechargeable battery and covered with durable plastic and aluminum housing. This light is suitable for porches, back entrances and near garage. It comes with 3 rechargeable Ni-MH batteries with 9 feet of wire. It can activate up to 150 times when on for one minute at a time. Come with a plastic body. But it has a feature that 2 light heads are adjustable in different directions, it is a dual head LED security light with 8 super bright LED. It is also has durable weather proof housing. Produce over 160 lumen with a single head light. Ni-MH battery is less good as other types of rechargeable battery. 80 super-bright LEDs lights make the MAXSA Innovations 40226 solar powered security l﻿﻿﻿﻿ig﻿﻿﻿﻿﻿﻿h﻿﻿﻿﻿﻿﻿t one of the brightest solar motion flood lights! Suitable for lighting up your garden, porch, deck, yard, areas around the house or shed. This light comes with a 3.7 V/3.6 Ah rechargeable lithium-ion battery and 15 feet of wire. It can be activated up to 130 times-one minute at a time. 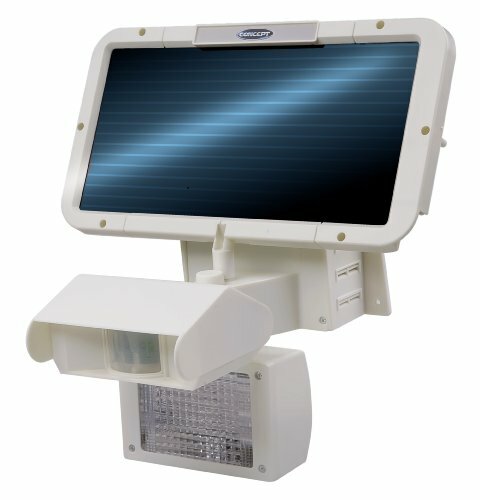 Motion-activated solar powered security floodlight has a plastic body and can automatically turns on the light when motion is detected and 80 LEDs produce about 350 lumens. Easy DIY so no electrician is needed. Less IP rating than others. Concept SL series has awesome bright LEDs, it is compact and attractive. This unit is built for outdoor weather and can be easily installed in multiple configurations with effort & minimum tools. Concept SL 32 LED has lead acid rechargeable battery that is so good. Also has a 4V/4.5Ah battery and 20 watt CFL. It can light-up up to 10 hours in a full charge. This light can cover up to 190 feet of yard. Best for yards, garages, garden, backyards etc. 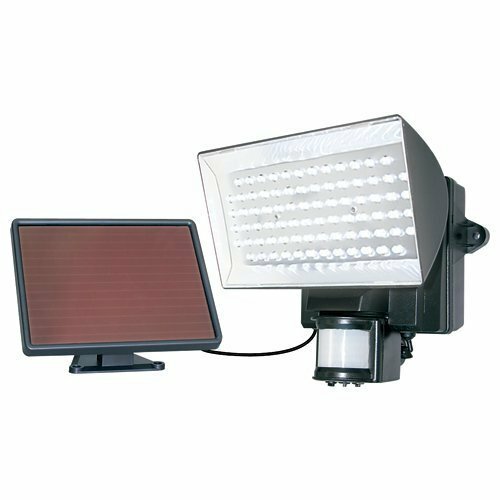 Maxsa 40330 solar powered security light is perfect for continuous lighting of signs, flags, driveways, yards, garages or any kind of large outdoor area. The 12 super-bright LEDs automatically turn on at dusk. It comes with 3 rechargeable NI-MH batteries and 15 feet of wire. Light stays bright for 5 hours at the full power setting, or up to 10 hours in the power saving setting. It also has a durable metal body which is long lasting. Has an easy DIY installation so no electrician is required. 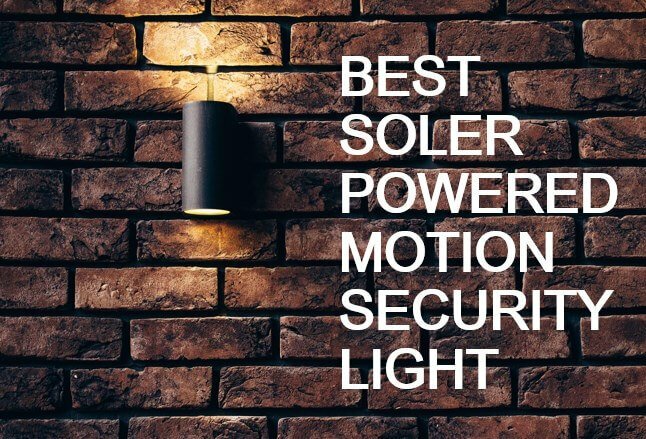 Before purchasing a solar motion light, you need to consider some features and abilities of it. Mainly, we have to look up about the following things to get the best solar security light. Solar panel is a most important thing of a motion flood light. It is one of the key parts. The security light collects power from the sun through the solar panel & stores it into the battery to supply power to the security light. There are some kinds of solar panel like Polycrystalline﻿﻿, Monocrystalline & Amorphous. Amorphous is for general use, it is less Good as others types. If you want a powerful solar security light, then you’d get a light with either Monocrystalline or Polycrystalline solar panel. Wattage is also important. A lower power light may run by a 1-5 watt solar panel, but a larger light needs 10-15 watt solar panel. For this, the size of a solar panel is important. Because the larger the solar panel, the more watt will be produced. When you’re going to use a flood light outside, which means it has to face all king of weather. So, it’s important to get a light which has a high quality build material so that it can be properly placed all year round. You should but a light of Aluminum casing instead of Plastic. You also should check the IP (Ingress Protection) of IP65 (Dust Protected) or IP68 (Liquid Protected). You should also look over mounting hardware and cable length so that you can maintain it easily. Sensors, as like as motion detectors and photosensors have a significant part in solar powered security light cause they help to converse the battery power and switch the light when necessary. There are many kinds of motion detectors, but among them, PIR is most effective. And make sure that it is a adjustable PIR sensor & also has a “Automatic turn on at night” sensor. As solar panel cannot collect or produce energy at night, they store energy during the daylight into the rechargeable battery to provide power to the light at the night, and so you must find a light with a powerful battery. We found four different types of rechargeable batteries that used in solar security light. They are- Li-Phosphate (LiFePO4), Nickel-Metal Hydride (Ni-MH), Lead Acid & Nickel-Cadmium (Ni-Cd). 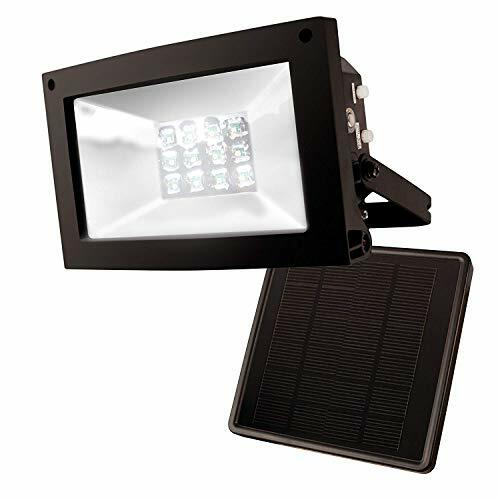 High power solar panel security flood lights are generally powered by either Lithium-Ion (generally by lithium iron phosphate which has the most advantages for solar panel lighting from all Lithium-Ion batteries) or lead acid batteries. Li-Phosphate (LiFePO4) is more common battery for the wide range of solar security lights than the lead acid battery; because it has higher specific energy. Battery capacity is also a significant fact. You need at least 4000mAh-7000mAh battery capacity for high power light which can be found in Lithium-Ion battery or Lead Acid battery. Lead Acid batteries are also a most common rechargeable battery option for high power solar security lights. 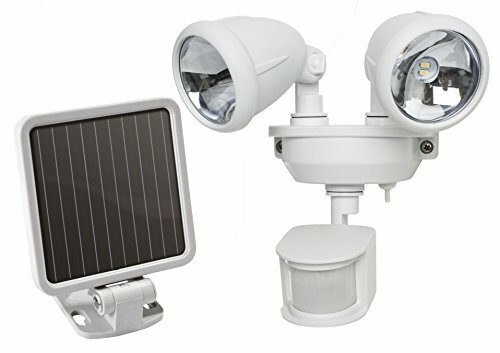 This is the main part of best solar powered outdoor security lights because of illuminating a certain area at night. You must have to choose a bulb type carefully to get the best performance. There are different types of bulb such as LED, CFL, HID, Halogen, HPS, MH etc. But among them, LED light is the best because of its brighter light and less power use. So, it is important to choose a flood light with a LED bulb. 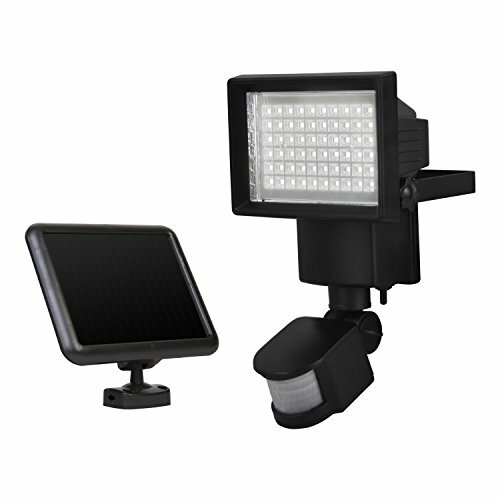 Solar powered security motion flood light is really helpful to prevent thieves and unwanted strangers in your house around. You can also use it as a great decoration of your house. It does not required electricity because it runs over the power of solar energy. It is also weather proof so that you don’t need to be worried during bad weather. But you must carefully choose the best one for you. Good luck.